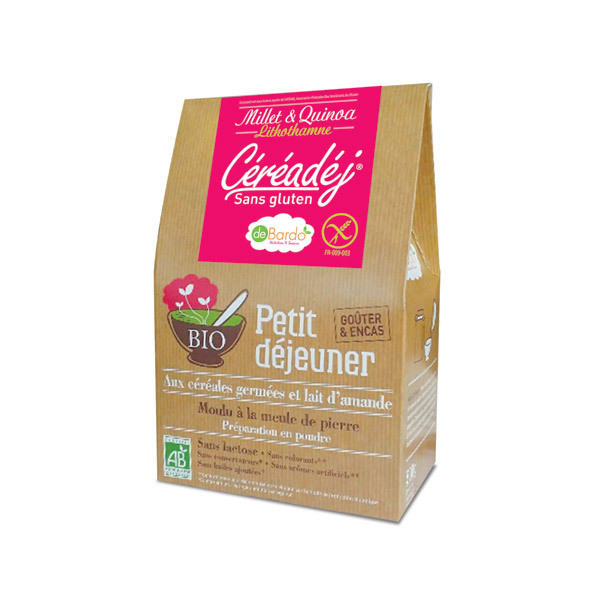 Cereadej - Organic adult mixed cereal breakfast product, is full of cereals and grains, an excellent source of energy. 400g. - Ingredients: Sprouted grains * ( 47.50 % - Millet , quinoa, rice) * Instant almonds (almonds 20% , corn maltodextrin, natural flavour, natural rosemary extract ) , instant chestnut * ( chestnuts 15% maltodextrin corn, and maltose) , lithothamne powder. - An excellent product : glutenfree, high energy source, minerals and fibre! - Almonds and Chestnuts are obtained from blanched almonds and chestnuts , partially defatted by a method preserving the nutritional qualities of fruits. - Storage: In a cool , dry place away from light. The bag must be sealed after use. Store 3 for months after opening.
. Mix 3-4 tablespoons Tonidej ® with 3-4 tablespoons of cold water or warm soup. Mix well.
. Variation: Add 1 minced or grated apple , prunes, fresh or dried fruit ( mango, banana , cranberry ... ) , nuts or oil soaked. Food is an essential part of our health and sometimes during varies stages of our lives we may need to alter or vary our diets (childhood, adolescence, pregnancy, convalescence ...). For over 15 years, Debardo ihave been commited to offering products with high nutritional values ​​adapted for varies stages of life or simply for a change in diet. Debardo favours quality raw materials to ensure maximum benefits for your health and undeniable Flavour! The Debardo products (Debardo vegetable drinks, cereal gluten Debardo, food supplements Debardo ...) can also meet more specific needs such as, food intolerances and a range of healthy and natural foods for the whole family. Debardo has focused its efforts and research in the field of natural health as well as a better understanding of the human body. Debardo relied on traditional practices and organic food and other materials! Discover the Debardo range of natural foods and products at Greenweez.